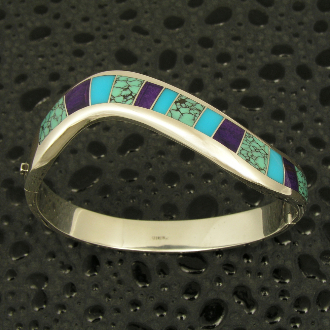 Elegant curved channel bracelet in sterling silver inlaid with spiderweb turquoise, sugilite and turquoise. Bracelet is hinged and measures 11 mm wide at the top. The bracelet measures 2 1/8" by 1 7/8" on the inside. This bracelet cannot be sized, but I can make a new one for you in any size in a few weeks. Spiderweb turquoise occurs when iron oxide fills in cracks or voids in the turquoise. The pattern created is random, with the webbing varying in thickness from extremely thin to wide bands. There is no set pattern or width to the veining. The pattern created is considered attractive and raises the value of the turquoise. In the Southwest and the Far East, spiderweb turquoise is very popular and commands the very highest prices. Sugilite is named for the Japanese geologist who discovered the first specimens in 1944, Ken-ichi Sugi. The location of the first discovery was the Iwagi Islet in Southwestern Japan. The original Japanese sugilite samples were just tiny, yellow crystals with no gem value. In 1955 some dark pink crystals of no gem value were found in India that were also identified as Sugilite. "Occasionally, there is something new under the sun or, in the case of a beautiful new gem called Royal Lavulite, under the earth. The deep translucent purple stone, known to mineralogists as sugilite, was officially classified as a rare gem in October 1980, and prices for the stone quickly climbed to as much as $1,000 a carat, compared with $3,000 to $5,000 a carat for the finest grade commercial diamonds. Sugilite has been found in Japan and India, but only in small deposits that were not of gem quality. In August 1980, workers in a manganese mine in South Africa first discovered a vein of purple stone after a cave-in. They smuggled the stone out in their lunch pails, and from there samples were brought to the U.S. Phoenix jeweler Randy Polk saw them, and traveled to South Africa. Polk went from house to house in the dusty interior town of Hotazel, negotiating with the miners to buy the stones. He now owns nearly 100 lbs., or half the estimated world supply."